A Cordura saddle is constructed with the light weight, extremely durable fabric knows as Cordura. Exactly how much Cordura is in a saddle, and where it’s at (jockeys, fenders, skirting, etc.) varies from saddle to saddle. Cordora saddles can offer their owners a quality saddle that weighs less and costs less than a comparable saddle made entirely of leather. The Cordura in a saddle is also easier to care for than leather. For more information about Cordura please scroll down beneath the saddles for sale. Below: The Fabtron Easy Rider All Around Trail Saddle with Cordura fenders and skirt. This one’s from HorseSaddleShop, which often has the best price on any saddle, including Cordura saddles. HorseSaddleShop.com image. Used with permission. 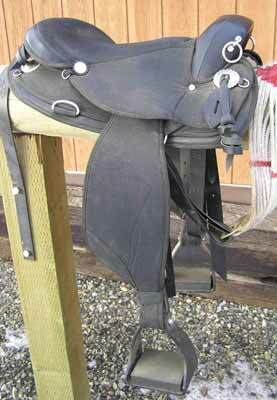 The Cordura saddles below are made by Big Horn, Fabtron, and other well known saddle makers. The saddles are available from eBay, Amazon, and HorseSaddleShop. What Is A Cordura Saddle? First off, it’s probably easiest to begin with what “Cordura” is: Cordura is the brand name for a family of extremely durable fabrics that are resistant to abrasions, tears and scuffs. Cordura fabrics come in varying ranges of constructions and weights, and include versions specifically designed for tear resistance, color retention, and light-weight durability. Cordura is ten times more durable than cotton duck, three times more durable than standard polyester, and twice as durable as standard nylon. A Cordura saddle, then, is a saddle built using Cordura fabric. In other words, it’s not a brand or type of saddle. Exactly how much Cordura any particular saddle contains and where it’s at (for example, the saddle skirts, fenders, etc.) varies from one saddle to another. Below: A Cordura endurance saddle. A black Cordora endurance saddle. 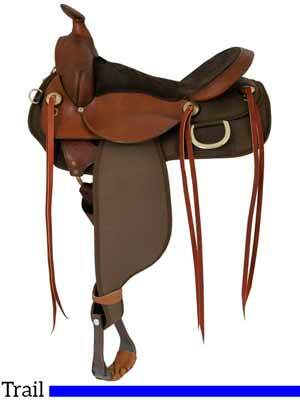 Cordura saddles are popular for a variety of of riding disciplines including trail riding and endurance riding. Easy maintenance is just one of the reasons Cordura saddles are so popular. To clean dirt, mud, sweat, etc., off of the Cordura parts of a saddle all that is usually required is to wipe it with a damp cloth. If necessary, mild detergent can be used followed by a thorough rinsing (do NOT use bleach). Note: Always read and follow any care and cleaning instructions that come with a Cordura saddle over information you may find here.